Scale cubes used for taking pictures and photographs of meteorites, geology, plants, or anything where you need an object in the picture as a reference for size and/or direction. They are made of Tungsten Carbide, a very hard dense material. Properly cared for they should last a lifetime. They come in un plated, PVD (18 K gold), PVD (Black which is made of Titanium Nitrile and Aluminum) You can get them as either shiny (polished) or matte (brushed) finishes. N, E,W, and S on sides. All letters have a dot showing the bottom of the letter. 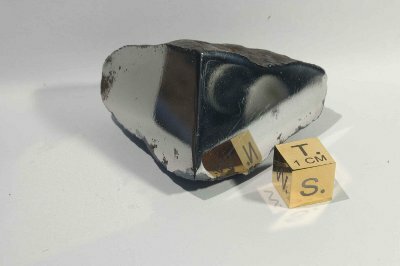 Scale cubes are used for a variety of purposes, used in geologic pictures taken in a photo studio, and as a reference in photographs where the size of an object would not otherwise be known. (Geologist often used shovels or rulers in the past but scale cubes are now being used often in taking pictures of small objects) They are often used where the faces can be aligned to match compass bearings. The different faces (T-top, B-bottom, N-North, S-South, E-East, W-West) can also be used as an indication as to which side of the object the viewer is seeing. Click on below picture to buy the scale cubes. Prices range from 23.25 to 29.50 dollars with a flat 4 dollar fee for USA shipping and 6 dollars for international. They all come with there own black velvet bag. The above pictures have been made to have a pure white background and some details have been lost.